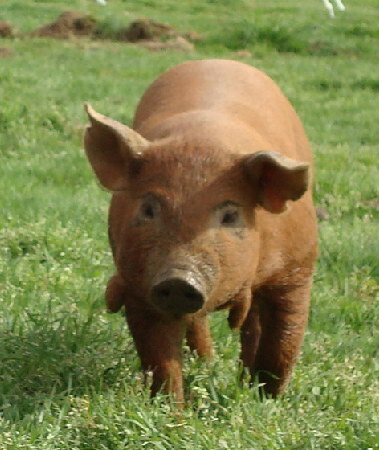 The Red Wattle hog, or Red Wattle pig, is an American meet pig. They are red and and have distinctive wattles or tassels. They typically weigh 600 - 800 pounds (270 - 360 kg). Large pigs can reach 1,200 pounds (540 kg), 4 feet (120 cm) in height and 8 feet (240 cm) in length. They normally have 10 –15 piglets per litter. They grow fast, forage well, and are hardy, mild-tempered and resistant to disease. They are suitable for extensive management. Red Wattle hogs are on the threatened list of the American Livestock Breeds Conservancy (ALBC).